I was only a kid when SMU got the death penalty so I never really understood a lot of the details, so Saturday night’s 30 for 30 – Pony Excess on ESPN was highly intriguing. What I enjoyed the most was the ending – all the small news clips of other universities cheating. It bewilders me that another school has never received the death penalty, and the similarities with how the SMU coach darted off to the NFL and Pete Carroll makes me raise an eyebrow. I didn’t know that Bill Simmons, ESPN’s “The Sportsguy,” was an executive producer for the 30 for 30 series. Funny thing, but he was in Dallas for a book signing on Saturday as the 30th episode of 30 for 30 aired about a subject in the heart of Dallas, TX. One thing that I thought was missing was an update on what the former SMU coaches are doing, heck, I would have liked to know what happened to the SMU coach right after the death penalty was dropped. It was crazy seeing a nationally televised program and seeing our local news and sports reporters showcased. One image from that special that just lingers in my head was the picture of the great Forrest Gregg – you saw him sitting in a chair surrounded by his HOF jacket, books, awards, and all other credentials that certifies his greatness. I stopped reading Bill Simmons a few years ago, his column use to be can’t miss and a highlight of my day. After a little research I was surprised to know that he’s got a little bad blood with ESPN as of late. The Jerry Jones interview on 60 Minutes wasn’t as good as I hoped for. I don’t know what I was looking for, and maybe it’s because he’s highly publicized locally, but nothing really was revealing other than the talk of his father’s store. Scott Pelley did keep giving Jones credit for his GM skills during the previous Super Bowl runs, but that’s a mistake because Jimmy Johnson had it in his contact that he was in charge of player personnel. 60 Minutes also had a segment on Brazil and stated the country is slightly bigger than the continental 48 – that surprised me. However, the CIA World Factbook sez different. I guess it just depends on how you measure it, counting bodies of water and whatever else. Jerry’s story about getting his credit cards cut up at Love Field trying to rent a car. It was cool of NBC to show the Don Meredith tribute. I always knew the Metrodome had an air supported ceiling, but never knew that speakers were hung from it, as you can see in this video when it collapse from the weight of snow yesterday. I wonder why the stadium was being filmed from the inside at the time? The game has been moved to Detroit, and funny enough, it will be the first Monday night game in Detroit since 2001. Oddly enough, this happened in Detroit a while back, read about all the irony here. There must be a war against NFL cheerleaders wearing those naughty Santa outfits because I didn’t see any this weekend and that’s a national tragedy. It’s just Christmas without cheerleaders in naughty Santa outfits. “I don’t HAVE to, I GET to.” One of my readers left that comment on Friday in reference to how we treat life sometimes. I love it. Things are getting interesting in Austin with Will Muschamp leaving to coach Florida. Heck, I don’t blame him. He may have been named the coach in waiting, but you gotta strike when the iron is hot. But the big rumor I hear is that Major Applewhite will be leaving with Muschamp to be the new offensive coordinator. Personally, I don’t think that will be a big loss for the UT coaching staff. UT has deep, very deep pockets, and I read in a Texas Monthly article that their athletics program is separate from the school, so it will be interesting to see what happens. I hope to see Mike Leach back in college football soon, preferably Miami. I still don’t know what to think of the Obama and Bill Clinton press conference. Despite canceling a leg on their tour U2 made it to number two on Billboard’s top 25 grossing tours this year. U2 played 22 gigs but was topped by Bon Jovi which played 69 gigs, so that should tell you just how big a crowd U2 is playing to. Funny thing, but if you look at the list, the top three are all “older,” heck, they dominate the top ten. Fellowship Church is having a 3-D Christmas. If not for Christmas carols the likes of Bing Crosby and Nat King Cole would be forgotten. 50 Most Unbeatable Records in Sport – Nolan Ryan made the list three times. WifeGeeding made some cuts in the Christmas card list. How Would NASA Rescue An Astronaut Who Floated Away From The International Space Station? 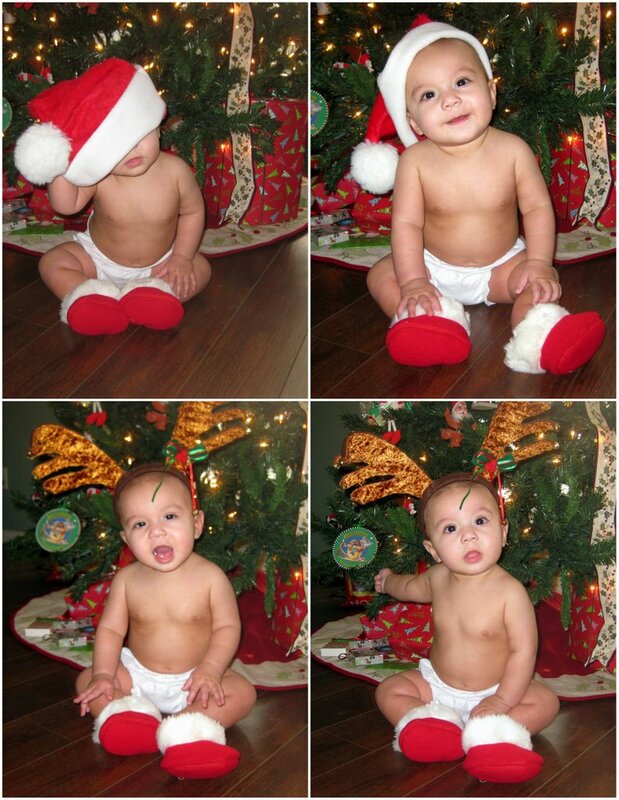 Santa Baby……..you are tooooo cute! And so is your little reindeer! That is the cutest little Santa sitting under the tree.. This will be a Merry Christmas for the Geedings. Great pics. A baby's first Christmas is a blast. I'm glad I'm not the only one that's lost interest in Bill Simmons. I gave him up a few years ago and just started paying more attention to him again when I started following him on Twitter. I saw a story yesterday explaining that a Fox crew left a camera running overnight on Saturday because they were told that there was a risk of collapse from the heavy snowfall.